The Campus Farms combined are 389 hectares in size and encompass Laureldale, Trevenna, Maxwellton, Toombs and Clarks Farm. Located within a short walk from the agriculture precinct and glasshouses, Trevenna provides an ideal location for small scale agronomic and sheep production research and teaching. With small plots fenced to exclude livestock, native animals such as kangaroos and pests such as rabbits, this property allows for undergraduate crop competitions and small crop experiments. Soil pits have also been excavated for soils teaching. Insect traps are also deployed on this property for entomological collection for teaching and research. In conjunction with Maxwellton, sheep research projects related to grazing management, wool production, parasite management and lambing are conducted. A major proportion of Trevenna is a pine forest planted as a commercial forest lot. This forest is now home to a mountain bike track used by the Armidale community. Used to support undergraduate teaching, Clarke’s provides a real-world field site to study soils. Joining the main UNE campus on the eastern and northern side, Clarke’s Farm is predominately used to support undergraduate teaching by providing a real-world field site to study soils within the context of a commercial sheep property. With a range of soil types across the property, Clarke’s has excavated soil pits to illustrate the different types and the different horizons throughout the soil profile. Located within a short walk from the campus, Maxwellton provides an ideal location for livestock production research and teaching. Maxwellton lies immediately to the west of the UNE campus, is watered by Dumaresq and Pipeclay Creeks and encompasses a range of soil types. Split into a number of smaller paddocks this property is used for sheep production, parasitology, reproduction and grazing research and teaching. With a range of topography across paddocks Maxwellton provides variation in feed and shelter availability. The proximity of this property to the main UNE campus also makes it ideal for student research. Maxwellton is used to collect data underpinning the development of biophysical models of livestock production and health, greenhouse gases and guarding behaviours of alpacas when grazed with lambing ewes. On-animal and video monitoring facilities permit the study of animal behaviours in responses to threatening and non-threatening stimuli. Connecting with industry the pasture technology site is used to evaluate the performance of a range of pasture and forage crop varieties. The Toombs UNE block is currently leased by PGG Wrightson Seeds for evaluating forage plant genetic performance and to undertake agronomic trials in the New England. PGG Wrightson Seeds is involved in a wide range of research to assist agronomists, farmers and rural retailers achieve a greater understanding of pastures and crops, improving productivity and profitability on-farm. Their network of research facilities allows them to breed and evaluate new products under animal grazing, prior to commercial release. This helps ensure each cultivar delivers the production gains anticipated and is safe for animal systems. Approximately, 200 trials are conducted annually at over 15 trial sites (one of which is Toombs) throughout the country, making it the largest replicated pasture trial programme in Australia. Some of the key species currently being evaluated at Toombs include Cocksfoot, White Clover, Annual, Italian and Perennial Ryegrass, Continental Tall Fescue, and novel endophytes. 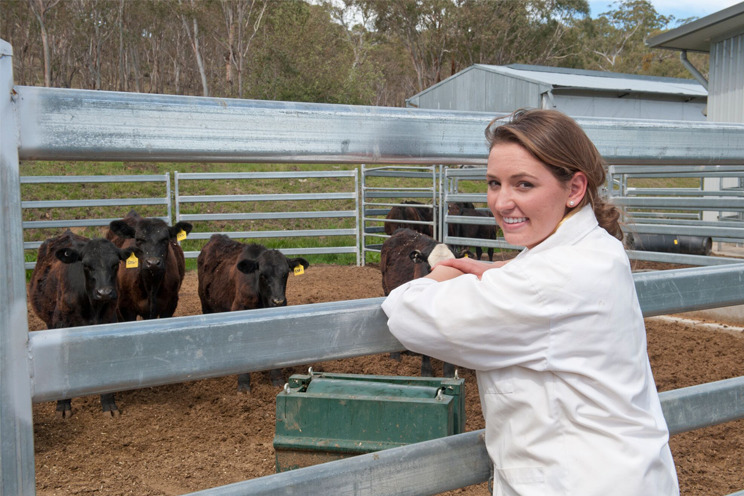 Located adjacent to the main UNE campus Laureldale is used for evaluation of crops and pastures, assessment of poultry health, behaviour and producivity, sheep parasitology and dog research and training. Long-term agronomy plots are used for crop research including assessing wheat varieties for genes that confer resistance to the Barley Yellow Dwarf virus. Internal nematode parasites of sheep are the largest animal health cost to the Australian sheep industry. Plots are used to study the epidemiology of infection particularly to characterise the ecology of major parasites and the host response to infection. Poultry facilities are operated to perform research in both, free range egg and meat production to mimic and assess industry and commercial practice in these areas. The layer facilities include an open curtain shed with conventional cages, a barn shed and 40 free-range layer pens while the broiler facilities include four 20 x 40 m rooms with independent ventilation, lighting control and variable partitions along with other facilities with floor pens and conventional cages. Some of these facilities are equipped with video monitoring that can be accessed remotely for monitoring and managing of the birds. The recently upgraded Laureldale Dog Research and Training Facility provides the opportunity for controlled studies in canine behaviour, training and nutrition. Research is non-invasive, using privately-owned dogs. Some of the current research focuses on scent detector dogs utilised for quarantine and wildlife conservation.